Could the new fancy Pebble be the best yet? It's been a big month for Pebble. The Redwood City based company has revealed not one smartwatch, but two, along with the Pebble Core non-wrist device geared for runners. Pebble has kept up with the familiar rectangular shape - save for the Pebble Time Round - but Pebble Time 2 is definitely ups the level of class to its circular predecessor. Like the Pebble 2, Time 2 isn't a huge diversion from Pebble Time. It's more reminiscent of the Time Steel which isn't far from the facts. Pebble founder and CEO Eric Migicovsky even told me Time 2 is built on the same hardware platform as Steel. Time 2 is made of steel rather than plain 'ol plastic. The most noticeable change comes in the form of the bezel which is significantly smaller than the Time's. It's certainly an upgrade in materials giving it a weighty feel in the hand. Time 2 is also the same weight as Time Steel, which is a bit heavier than the standard Time watch. The 50% more viewing area from less bezel allows you to peruse the color display better which is fantastic since the other screen felt so claustrophobic. Migicovsky says the watch case is the same size, and that it's the display technology that's improved. "We've been working with the display manufacturer to figure out a way of reducing border size which is one of the biggest pieces of feedback we got back from our customers. I think we've been able to crack it and get it down to this state." Upon closer inspection, you can really see the new higher resolution that shows off 80% more pixels but until we test it out, we won't know how it fares outside in brighter settings. Like the Pebble 2, the Pebble Time 2 is coated in scratch-resistant glass, has a built-in microphone and includes a new heart rate sensor. The Time 2 comes in gold, silver and black giving it an air of fancy wristwatch but the band it ships with will be silicone. It's easy enough to replace with the quick release mechanism if you want a leather band. Since the company has geared itself towards health now, Migicovsky says the silicon band was chosen opposed to the Round's leather because it's better for fitness where the leather isn't. "We're really taking a renewed focus on the health and fitness aspects of the watch. We wanted to make sure it was water resistant up to 30 meters like the rest of our products, but also added a rubber strap so you can work out or swim." The general layout of buttons on the Time 2 is similar to Time's, complete with a back button on the left and up, down and select buttons on the right of the frame. A new framework called Actions lets you use the buttons to quickly access actions. For example, pressing the top right button can bring up whatever shortcut you want to assign. The Timeline interface should be one you're used to though there are some additions. Notifications now pop up on the bottom of the home screen instead of taking up the whole screen. My time with the watch was short but so far, I was pleasantly surprised by the Time 2. It's basically the same package as before, but it looks and feels better all around. Time 2's larger screen real estate puts it closer to its smartwatch brethren and coupled with the new features, heart rate monitoring and software upgrades, this could be the best Pebble yet. The Pebble Time 2 is selling for $169 on Kickstarter but will be flat a $199 when it goes on sale globally in November as it heads to other retailers later this year into early 2017. We'll be reviewing the Pebble Time 2 in full when it's available. 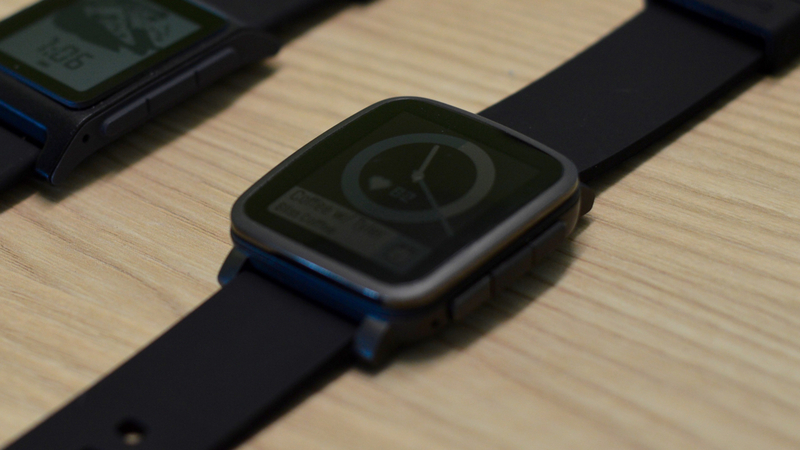 In the mean time, our guide has everything you need to know about Pebble Time 2.